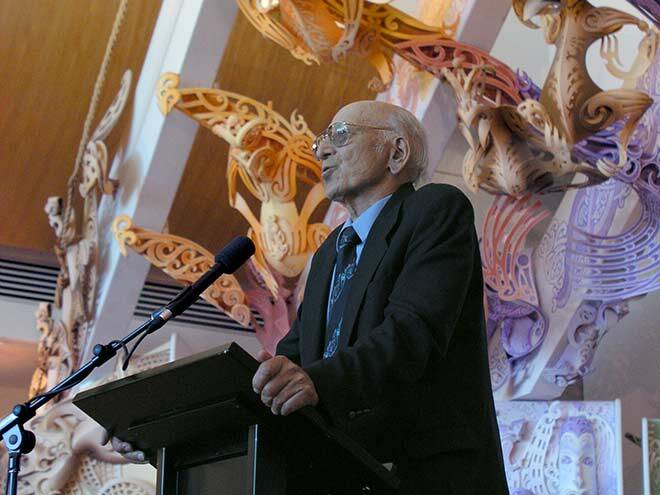 Dr Ranginui Walker is shown speaking on the marae at the Museum of New Zealand Te Papa Tongarewa, at the 2006 launch of Māori peoples of New Zealand: ngā iwi o Aotearoa, a book based on Te Ara's Māori New Zealanders theme. The ideology of biculturalism is predicated on the fact that the new nation brought into being by the Treaty of Waitangi is founded on two cultures. The base culture is that of the tangata whenua, the people of the land whose mythology and tribal traditions connect them to their signifying symbols on the landscape. The overlying culture is that of the coloniser, which attempted to obliterate Māori culture by assimilation. The recovery and efflorescence of Māori culture in the second half of the 20th century negated the policy of assimilation by demonstrating that two cultures can co-exist and interact creatively to the benefit of both. The dual naming of Manatū Taonga, the Ministry for Culture and Heritage, reflects official adoption of the ideology of biculturalism by the state. The government demonstrated its commitment to biculturalism when it initiated work on The dictionary of New Zealand biography as a contribution to the 150th anniversary of the signing of the Treaty of Waitangi in 1990. The Dictionary documents the lives of significant Māori and Pākehā players in the development of the new nation over the last 200 years. The main committee overseeing the project comprised academics, historians and a representative from the National Library. To ensure that the Māori side of the nation’s story was properly represented, the ministry established a Māori committee chaired by Tīpene O’Regan. This committee selected the ancestors for inclusion in the Dictionary and the appointment of authors to write their stories. Chief Historian Jock Phillips initiated Te Ara, the Encyclopedia of New Zealand project. The Māori name 'Te Ara' for the encyclopedia means the pathway to the internet, where all the information on New Zealand can be accessed online. As in the Dictionary project, a sub-committee of Māori academics and historians was established to select authors to write the Māori stories for the Te Ara. The incorporation of Māori knowledge into the Dictionary and Te Ara provides a corrective rebalancing of what was previously a one-sided history written by Pākehā historians.